I am addicted to Mexican food. Seriously... not joking. I love it. Good chips and salsa are my favorite snack. I'm picky about my Mexican food too. None of that ketchup-y flavored salsa and such. Around here, good Mexican food is pretty hard to come by so I often make it myself. I usually feel like my salsa is better and its no where near as greasy. 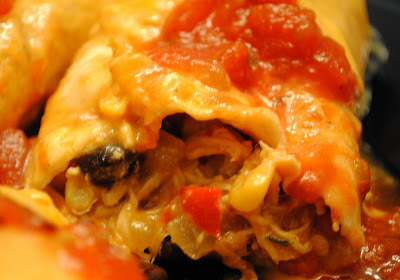 I learned to make enchiladas a long time ago in my high school Home Economics class of all places. 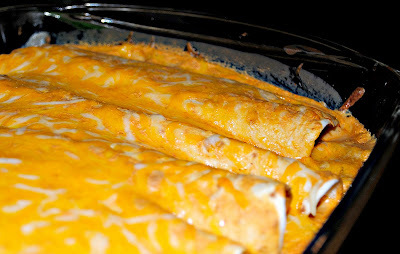 Back then we made them with ground beef and cheese and little else, dipped the tortillas in enchilada sauce and smothered them with cheese. Sure they were good but I've played with this recipe many, many times and there have been some definite improvements. This current version is delicious. This dish has the required "red sauce" you'll usually find in restaurant versions of enchiladas but I mixed it with sour cream and green chilis and lime juice to make it creamier and add more flavor. The filling is juicy, shredded chicken breast that I made in my crockpot with some black beans and corn thrown in as I put it all together. Don't be put off by the number of steps - you can make the chicken in the crockpot while you're at work or the day before and the rest comes together very quickly. Traditionally enchiladas are made with corn tortillas, but I'm not a fan so I use flour tortillas, use whichever you prefer. I generally use 6" whole wheat flour tortillas. 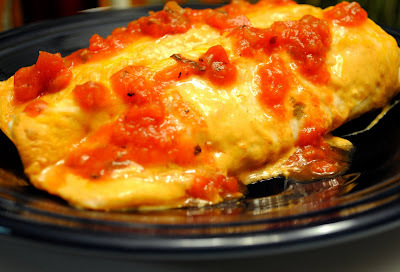 Add chicken to crockpot insert, add tomatoes, seasoning, and lime juice and add water. Make sure there is at least 1" of water in the crockpot. Cover and cook on low for 6-8 hours or high for 3-4 hours. When the chicken is cooked through, drain off the water, reserving the tomatoes, shred chicken with 2 forks, mix with tomatoes and set aside. Preheat oven to 350 degrees. Spray a 9x13 baking dish lightly with cooking spray. Spread enchilada sauce in the bottom of the pan. Heat olive oil in a large skillet over medium high heat. Add onions and garlic and cook about 5 minutes until softened and translucent, add beans, corn, and jalapeno and stir to combine. Add chicken and cook until hot. Add 1/2 of the cheese and stir until melted and remove from heat. Warm tortillas wrapped in a paper towel for about 20 seconds in the microwave so they are flexible. Add a couple spoonfuls of filling in a line down the center of each tortilla. Fold over one end and roll up tightly. Lay seam-side down in prepared baking dish. Place enchiladas tightly together, continue until pan is full. In a food processor, combine all ingredients and puree until smooth. 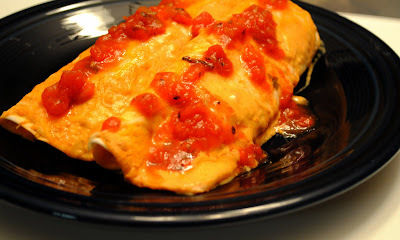 Pour sauce over enchiladas. Top with remaining grated cheese and bake about 30 minutes until bubbly. Top with salsa, more sour cream or guacamole as desired. LOVE these. They are going on my must-try in March list!! next time tommy says what are we having for dinner i'm going to say click on jen's blog and pick something out....i found a bunch of stuff on here i'm going to make. Also i can't believe you didn't tell me you made the roasted nuts....i tried to make those awhile back and have been looking for a better recipe for those for awhile. Good Stuff! I am going to try these tonight. They look delish! !